In May 2012 it was revealed that Eishken Estate owner Nicholas Oppenheim investigating a further extension to the windfarm on the Eishken estate under the name Uisinis Power. This time to the south and east of Loch Sealg with current documentation discussing up to 30 turbines. He previoulsy announced that he had been successful in selling the rights to the previously consented Muaitheabhal Windfarm and Muaitheabhal East Extension to International Power part of French global company GDF-Suez. 28th December 2010: The Scottish Government issued a press release announcing that it had approved the 6 turbine, 21MW extension to the Muaitheabhal Windfarm (118MW, 33 turbines see below). The proposed extension turbines will be 150m high to blade tip, some of the largest onshore turbines proposed in the UK. 14 January 2010: The Scottish Government announced that it had given planing consent for 33 turbines to be built on the Eishken Estate. These are the turbines that were proposed in the last application by Beinn Mor and Crionaig Power in August 2009. A new application for the Muaitheabhal Windfarm, on the Eishken Estate, Isle of Lewis, is to be submitted on Thursday. This will be the fourth incarnation of the controversial project located in one of the Europe’s densest Golden Eagle populations. Moorland without Turbines are raising serious questions with regard to democracy and the planning system, as the results of a Public Local Inquiry, held last year into the previous, 53-turbine version of the windfarm, have still not been been published by the Scottish Government. • Eishken Estate is owned by hedge fund manager Nicholas Oppenheim, (http://business.timesonline.co.uk/tol/business/specials/rich_list/rich_list_2009/article6153229.ece). His first planning application for a 133 turbine windfarm on the estate was submitted in 2004. A revised application was submitted for 53 turbines in 2006 when it was revealed that the larger proposal could bcome one of the most destructive windfarms known potentially killing Golden eagles and rare White-tailed sea eagles every few weeks. 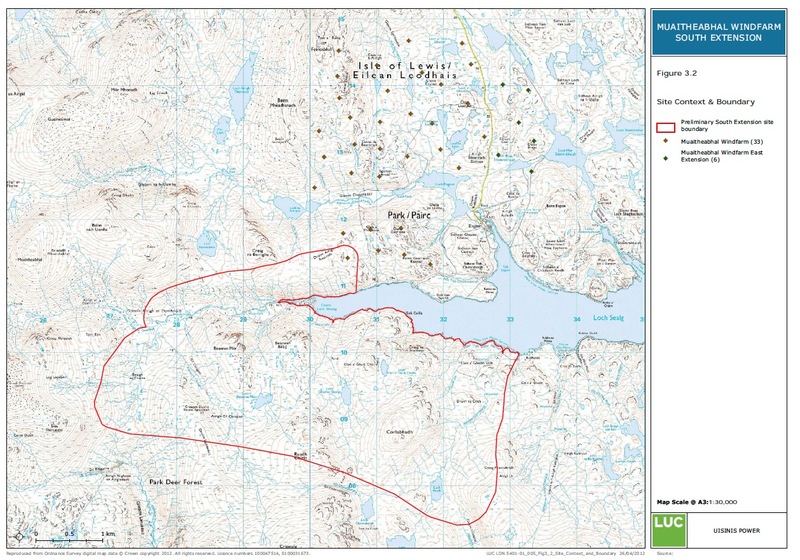 The windfarm also encroached upon the South Lewis, Harris, and North Uist National Scenic Area. Both planning applications were submitted to the Scottish government for determination due to their size. With the two larger scheme still in the government planning system Beinn Mhor Power Ltd submitted an application for a smaller 16 turbine subset of the larger scheme to the Local Authority Comhairle nan Eilean Siar in 2007. The authority have maintained a strong commitment to large onshore windfarms despite massive community opposition and approved planning permission to 13 of the 16 turbines in 2008. • The 53 turbine application was referred to a public inquiry in 2007 due to the potential adverse impact on the National Scenic Area (NSA). Presided over by Reporter Ms Janet Mcnair, a key point was whether any adverse landscape impacts to the NSA were overridden by social or economic benefits of national importance. It was anticipated that the Reporters findings would be published in autumn 2008. • At the public Inquiry witnesses supporting Beinn Mhor Power Ltd included Comhairle nan Eilean Siar, trustees of the Muaitheabhal Windfarm Community Trust, and the Erisort Trust. Those giving evidence against included Scottish Natural Heritage, the John Muir Trust, North Harris Trust and Moorland without Turbines. A number of individuals also participated on both sides. • The windfarm received considerable publicity over claims that a percentage of the windfarm would be available for community ownership, the largest of its kind in the UK. 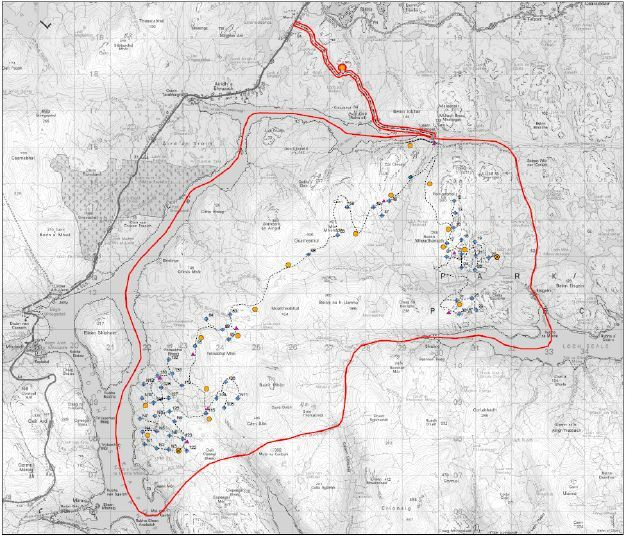 In the original application this amounted to 33 of the 133 turbines, however Beinn Mhor Power only ever secured a grid connection for their own turbines (300 megawatts) making it unlikely that the community component would proceed. In the revised 53 turbine application this was reduced to 6 turbines. At the Public Inquiry it was admitted that the community would have to raise in the region of £21 million to fund their component. • The Eishken Estate is designated as an Important Bird Area (UK244) for its Golden Eagle population, having one of the highest breeding densities in the EU. Along with the neighbouring Pairc Estate, the area is also one of the UK’s top spots for the rare White-tailed sea eagle. RSPB have maintained objections to the proposals throughout. 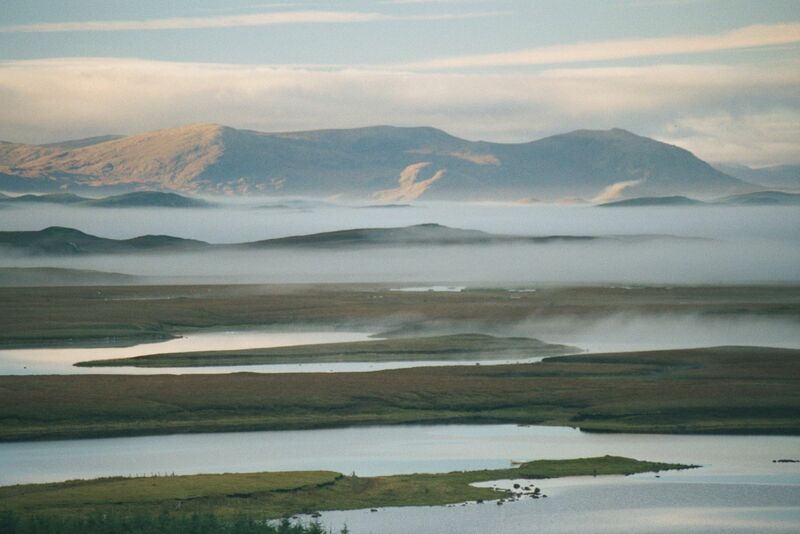 • In addition the Eishken mountain range forms the horizon known as the ‘sleeping beauty’ or Cailleach na Mointeach. It is along this horizon that the moon travels during the 18-year lunar cycle. Many argue that this phenomenon is behind the construction of the ancient and world famous Callanish Stones. The 53-turbine layout referred to a Public Local Inquiry in 2008. The Public Inquiry will commence on 13 May 2008, and be held in the Garry Room at the Caladh Inn, James Street Stornoway. In 2004 Beinn Mhor Power Ltd initially applied to build a 133 turbine 399MW windfarm on the Eishken Estate, in the south east of the Pairc Peninsula. The company proposed to construct turbines within the South Lewis, Harris and North Uist National Scenic Area (NSA) and the estate coincides with the boundaries of the Park Important Bird Area (UK244) which holds one of the highest densities of Golden Eagles in Europe. In common with other windfarm sites on the island, the area is dominated by peatland habitats including active blanket bog and Atlantic wet heath (both protected under Annex I of the EU Habitats Directive). Almost a year after the application was submitted it was discovered that there had been a serious error in the collision mortality estimates for both Golden Eagle and White-tailed Sea Eagle. The corrected estimates revealed that the windfarm could kill a Golden eagle every 3 to 6 weeks through collision with turbines. For White-tailed sea eagles collision mortality was estimated at an eagle every 8 to 15 weeks. Other protected species on the site include Red and Black-throated Divers, Merlin, Golden Plover and Dunlin. In 2006 Beinn Mhor Power submitted a revised application for 53 turbines. This new proposal effectively split the development with turbines proposed on Feiriosbhal in the north east of the estate, and a large group in the south west, on the shores of Loch Seaforth - with approximately 30 turbines proposed within the NSA. RSPB have maintained an objection to the proposal on ornithological grounds and Scottish Natural Heritage, the statutory body for landscape and conservation in Scotland have objected that the windfarm will have a significantly damaging effect on the National Scenic Area. In August 2007 it was announced that the application had been referrred to a Public Local Inquiry by the Scottish Executive. However later in the year Beinn Mhor Power submitted a third revision for a 16 turbine subset, to be considered concurrently with the 53 turbine application. Falling under the 50MW threshold, this application was made to the Local Authority, Comhairle nan Eilean Siar who had previously recommeded approval of the larger schemes. Unsuprisingly the Council decided to approve the application in early 2008, albeit with 3 turbines removed on grounds of visual impact. 133 wind turbines on the Eisgein Estate, each 125 m high, covering an area of 78.3km©˜ (bringing the turbines in planning for Lewis to 381). Turbines will be sited across the summits and flanks of the Eisgein hills. Every turbine will have a foundation and hard standing area 45m x 65m (approx. half the size of a football pitch) cut out of the hillside. There will be 77km of roads wide enough for heavy plant, 22 quarries and 10 construction/batching compounds. Tourism is our second largest employer and is estimated to be worth £40-£60 million per annum. Few businesses do not benefit from the economic boost of visitor spend. If these proposals go ahead, the Western Isles could face significant job losses, for which windfarm jobs would not compensate. Tower manufacture at Arnish is only a possibility, and according to the Eisgein ES, “…turbine components (tower sections, blades, hubs, nacelle units) will be delivered to Arnish by sea.” (para 12.22). Pylon lines will be required to connect windfarms to the interconnector, required to take power to the mainland. In recent consultations the Stornoway Gazette reported CnES as having a preference for 400kv lines (probably 50m pylons). The existing power route, adjacent to the Lochs road, could be followed. LWP report that most of their windfarm traffic will originate at Arnish. Although no figures are provided for the Lochs road, traffic through Newmarket is estimated at 20,420 HGV movements. BMP advise that up to 76,611 two-way vehicle movements will be required during construction. No assessment has been made of the potential disruption to traffic on the Lochs road from these two developments combined. First Minister Jack McConnell said the Scottish Government has already granted approvals for projects sufficient to meet its 2010 target of having 18% of electricity generated from renewable resources (SE Press release 18/11/2004). There are still 15 years to develop alternatives such as wave and tidal. The Western Isles should strive to become a real Renewable Energy Innovation Zone, working towards energy self sufficiency. This should, through time, give us cheaper energy, which would be the real magnet for keeping our people here, attracting others to come, and bringing in new businesses. Pioneering research and development in a range of renewable energy alternatives would create a diverse range of sustainable jobs without damaging the existing economy or our environment. The Beinn Mhòr Power windfarm is a private venture by Eisgein Estate owner Nicholas Oppenheim and associates. The numbers refer to the numbers in the Beinn Mhòr Power Environmental Statement. Please try and read the whole Statement if you have time. 3.52 Each of (22) “borrow pits (Quarries) 75,000 sq m. Estimated 20,000,000 cubic metres of rock will be required. 3.53 Drilling and blasting will occur. 3.55 10 temporary construction compounds 50m by 100m plus one of 50m by 150m which is likely to become permanent car park. 3.71 500 tonne crane plus one smaller crane to be used. Fig 3.6 Roads 5m or 6m wide plus drainage ditches. 10.30 Stone crushing is achieved through the use of crushing and screening plant which have multiple sources of noise, including raw stone being placed in a crushing unit, drive motors/engine and grinding teeth. Unlike short-lived blasting activity, such operations may be continuous throughout the working day. Typical noise levels of such plant are approx Lwa 118dB to 12 dB. 12.2 Some alteration would be required to the A859 to accommodate the abnormal loads. 12.19 The increased volume of traffic12.21 Road transport from Stornoway is the preferred option at this stage. Turbine blades….will require a vehicle of approx 50m in length. Hubs….will require a vehicle….possibly up to 5m in width. 12.27 77 km of track will be constructed on site. 12.29 These properties may be sensitive to change in traffic volume and composition. SNH Letter dated 17th August 2004. “The impacts arising from the relationship of the turbines to land form and the visual impact of views from public roads and settlements would be significant and adverse. Caution should be exercised in the siting and location of turbines and other structures. This should be as far away as possible from roads, village communities and coastal areas, as this will affect the Board’s ability to promote the unspoilt beauty of the landscape. NPPG14 Recognises that “The most sensitive landscapes may have little or no capacity to accept new development. Some of Scotland’s remoter mountain or coastal areas possess an elemental quality from which many people derive psychological and spiritual benefit. Such areas are very sensitive to any form of development or intensive human activity and Planning Authorities should take particular care that new development in or adjacent to a NSA (National Scenic Area) does not detract from the quality or character of the landscape. Please print out and use the objection letter here if you wish. Remember to add your address, the date, your name and signature. Please copy the letter for others to use, and personalise it by writing your own particular reason for objecting in the space provided. If you want your objection to be kept confidential you should make this explicitly clear, eg by ticking the box in the adjacent letter. If you can write your own letter to Paul Smith (address is Mr Paul Smith, The Scottish Executive, Consents and Emergency Planning Unit, 2nd Floor, Meridian Court, 5 Cadogan Street, GLASGOW G2 6AT or email to paul.smith@scotland.gsi.gov.uk ) it would be even better. You must refer to BMP’s planning application, and include the words ‘I object’. You can object to anything included in, or indeed left out of, BMP’s Environmental Statement. If you wish to make a proper study of the Environmental Statement before making a detailed objection, you can lodge a holding objection. You must indicate that you are doing this, and list the areas your later objection will deal with. You can list all the areas covered in the Environmental Statement.